A selective list of online literary criticism for the nineteenth-century Victorian poet and artist Dante Gabriel Rossetti, with links to reliable introductory material and signed, peer-reviewed, and scholarly literary criticism. 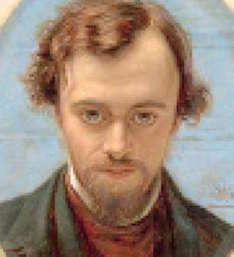 "Dante Gabriel Rossetti." An encyclopedia-type article on Dante Gabriel Rossetti, (unsigned but from a reliable publisher, professionally researched and edited) with text for some of his most famous poems. The Poetry Foundation . 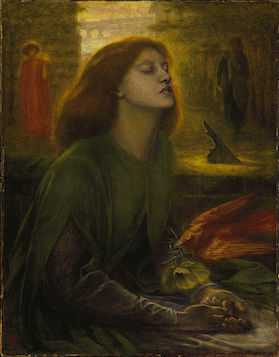 "Dante Gabriel Rossetti." A section on D.G. Rossetti covers his themes, techniques, and biography. Victorian Web , ed. Prof. George P. Landow. Bentley, D.M.R. "Political Themes in the Work of Dante Gabriel Rossetti." Victorian Poetry 17, 3 (Autumn, 1979), pp. 159-179 [jstor]. Danahay, Martin A. "Dante Gabriel Rossetti's Virtual Bodies." Victorian Poetry 36, 4 (Winter, 1998), pp. 379-398 [jstor]. Fontana, Ernest. "Pre-facing simile vehicles in Dante Gabriel Rossetti's sonnets." Style Winter 2005 [questia subscription service]. Hassett, Constance W. "Elizabeth Siddal's Poetry: A Problem and Some Suggestions." Victorian Poetry 35, 4 (Winter 1997) pp 443-70 [jstor]. Johnson, Roanld W. Dante Rossetti's Beata Beatrix and the New Life." Rossetti, Elizabeth Siddal, and "the theme of the beautiful woman." Art Bulletin 57, 4 (Dec., 1975), pp. 548-558 [jstor]. Maxwell, Catherine. "'Devious Symbols': Dante Gabriel Rossetti's Purgatorio." On "The Woodspurge." Victorian Poetry 31, 1 (Spring 1993) pp 19, 40 [jstor]. Weatherby, Harold L. "Problems of Form and Content in the Poetry of Dante Gabriel Rossetti." Victorian Poetry 32, 1 (Winter, 1964), pp. 11-19 [jstor]. "The Rossettis, William Morris, Swinburne, and Others." Quite old literary criticism, from The Cambridge History of English and American Literature (1907-21). Rossetti, W.M. "Dante Rossetti and Elizabeth Siddal" (1903). At The Dante Gabriel Rossetti Archive . "The Pre-Raphaelites." A well-illustrated introduction to the Pre-Raphaelites, by Dr Dinah Roe, for the British Library.